Winter is in full flow in emergency departments (EDs) and the volume of patients and lack of staff made January feel as if we were in peak February already. It appears that the most popular pastime in EDs is ‘trolley Tetris’. This is where, despite your best efforts to empty the ED and stick to the four-hour standard, it fills to overcapacity and people are cared for in corridors. Nurses, physicians and specialty staff then navigate in and out of cubicles squeezing through areas not designed for patient care. Overcrowding in EDs is a serious issue and should not be taken lightly, but I know how normalised corridor care has become. Rather than talking about the number of beds available at handover, we discuss the number of patients in the corridor. As emergency nurses we must continue to do everything we can to prevent this from becoming the norm. This year, these seasonal pressures are set against a backdrop of insinuations – starting at the very top with NHS England chief executive Simon Stevens – that the four-hour standard could be scrapped. Related: Should I be more concerned about patient care or the four-hour target? 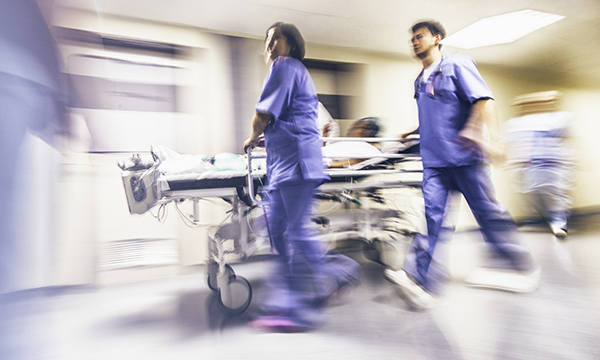 The standard does cause unrelenting pressure on emergency nurses, but dropping the target would leave us in a worse position, with overcrowding due to slower diagnostics, slower reviews and slower patient flow. There are days, especially at this time of year, when I truly hate the clock, but for patients it is a worthwhile cross to bear.